World Reflexology Week 2017 will take place in September. The theme this year is corporate reflexology. There’s so much evidence to show how perks for your employees provide greater productivity for your business, and that when employees feel valued their sense of wellbeing increases which again, in turn, creates job satisfaction. Sessions will take place in September 2017. If you have missed the charity booking and would like to arrange a day, or a half day session, for your staff please contact me to arrange it. Location is restricted to businesses in Borehamwood, Elstree, Shenley and Radlett areas. Your reflexology treatments are half an hour per person at £20.00 per each half hour. You can pay this on behalf of your employees, or ask them for the contribution. 1st session runs approx 9.00-12.00, second session runs 12.30-2.30. This covers for ten employees over the whole day. If you have less, please consider just a morning (six employees – £120.00) or an afternoon (four employees – £80.00). Check your chosen session/ day is free by contacting me on 07876254306. Make a bank payment/ cheque for the correct amount as calculated above. Email me at info@happysoles.net with employee names/ location required. Look forward to happy, content, valued employees. 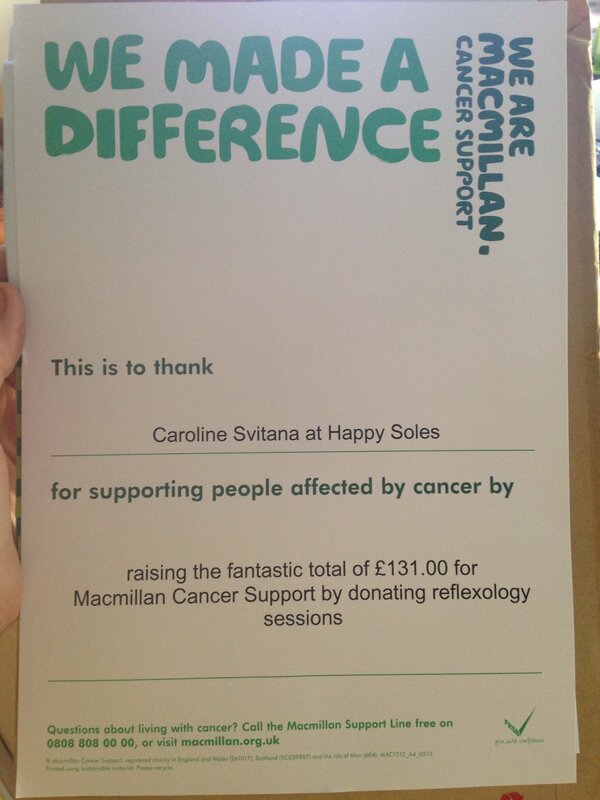 World Reflexology Week 2015 saw taster sessions in Borehamwood, which I gave in aid of Macmillan. Together we raised £131.00 and some wonderful ladies, one boy and a baby, enjoyed taster treatments in reflexology, reflexology with crystals (rose quartz and snowflake obsidian) and hot stones. Thank you to everyone who came along and took part! 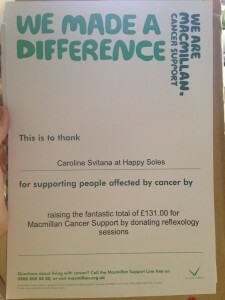 You can also donate direct to Macmillan, without reflexology, here. No Replies to "World Reflexology Week"